Computer generated animation of cut section of the human heart showing both ventricles. A ventricle is one of two large chambers toward the bottom of the heart that collect and expel blood received from an atrium towards the peripheral beds within the body and lungs. 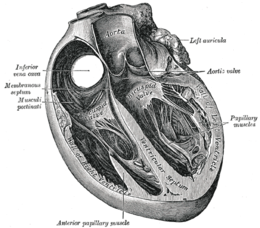 The atrium (an adjacent/upper heart chamber that is smaller than a ventricle) primes the pump. Interventricular means between the ventricles (for example the interventricular septum), while intraventricular means within one ventricle (for example an intraventricular block). In a four-chambered heart, such as that in humans, there are two ventricles that operate in a double circulatory system: the right ventricle pumps blood into the pulmonary circulation to the lungs, and the left ventricle pumps blood into the systemic circulation through the aorta. Ventricles have thicker walls than atria and generate higher blood pressures. The physiological load on the ventricles requiring pumping of blood throughout the body and lungs is much greater than the pressure generated by the atria to fill the ventricles. Further, the left ventricle has thicker walls than the right because it needs to pump blood to most of the body while the right ventricle fills only the lungs. On the inner walls of the ventricles are irregular muscular columns called trabeculae carneae which cover all of the inner ventricular surfaces except that of the conus arteriosus, in the right ventricle. There are three types of these muscles. The third type, the papillary muscles give origin at their apices to the chordae tendinae which attach to the cusps of the tricuspid valve and to the mitral valve. The mass of the left ventricle, as estimated by magnetic resonance imaging, averages 143 g ± 38.4 g, with a range of 87–224 g.
The right ventricle is equal in size to that of the left ventricle and contains roughly 85 millilitres (3 imp fl oz; 3 US fl oz) in the adult. Its upper front surface is circled and convex, and forms much of the sternocostal surface of the heart. Its under surface is flattened, forming part of the diaphragmatic surface of the heart that rests upon the diaphragm. Its posterior wall is formed by the ventricular septum, which bulges into the right ventricle, so that a transverse section of the cavity presents a semilunar outline. Its upper and left angle forms a conical pouch, the conus arteriosus, from which the pulmonary artery arises. A tendinous band, called the tendon of the conus arteriosus, extends upward from the right atrioventricular fibrous ring and connects the posterior surface of the conus arteriosus to the aorta. The left ventricle is longer and more conical in shape than the right, and on transverse section its concavity presents an oval or nearly circular outline. It forms a small part of the sternocostal surface and a considerable part of the diaphragmatic surface of the heart; it also forms the apex of the heart. The left ventricle is thicker and more muscular than the right ventricle because it pumps blood at a higher pressure. The right ventricle is triangular in shape and extends from the tricuspid valve in the right atrium to near the apex of the heart. Its wall is thickest at the apex and thins towards its base at the atrium. During systole, the ventricles contract, pumping blood through the body. During diastole, the ventricles relax and fill with blood again. The left ventricle receives oxygenated blood from the left atrium via the mitral valve and pumps it through the aorta via the aortic valve, into the systemic circulation. The left ventricular muscle must relax and contract quickly and be able to increase or lower its pumping capacity under the control of the nervous system. In the diastolic phase, it has to relax very quickly after each contraction so as to quickly fill with the oxygenated blood flowing from the pulmonary veins. Likewise in the systolic phase, the left ventricle must contract rapidly and forcibly to pump this blood into the aorta, overcoming the much higher aortic pressure. The extra pressure exerted is also needed to stretch the aorta and other arteries to accommodate the increase in blood volume. The right ventricle receives deoxygenated blood from the right atrium via the tricuspid valve and pumps it into the pulmonary artery via the pulmonary valve, into the pulmonary circulation. The typical healthy adult heart pumping volume is ~5 liters/min, resting. Maximum capacity pumping volume extends from ~25 liters/min for non-athletes to as high as ~45 liters/min for Olympic level athletes. In cardiology, the performance of the ventricles are measured with several volumetric parameters, including end-diastolic volume (EDV), end-systolic volume (ESV), stroke volume (SV) and ejection fraction (Ef). 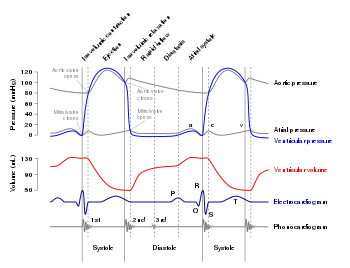 Wiggers diagram of various events of a cardiac cycle, showing left ventricular volume as a red trace. Yellow = left atrial pressure. Ventricular pressure is a measure of blood pressure within the ventricles of the heart. During most of the cardiac cycle, ventricular pressure is less than the pressure in the aorta, but during systole, the ventricular pressure rapidly increases, and the two pressures become equal to each other (represented by the junction of the blue and red lines on the diagram on this page), the aortic valve opens, and blood is pumped to the body. Elevated left ventricular end-diastolic pressure has been described as a risk factor in cardiac surgery. Noninvasive approximations have been described. An elevated pressure difference between the aortic pressure and the left ventricular pressure may be indicative of aortic stenosis. Right ventricular pressure demonstrates a different pressure-volume loop than left ventricular pressure. The heart and its performance are also commonly measured in terms of dimensions, which in this case means one-dimensional distances, usually measured in millimeters. This is not as informative as volumes but may be much easier to estimate with (e.g., M-Mode echocardiography or with sonomicrometry, which is mostly used for animal model research). Optimally, it is specified with which plane the distance is measured in, e.g. the dimension of the longitudinal plane. End-diastolic dimension EDD The diameter across a ventricle at the end of diastole, if not else specified then usually referring to the transverse (left-to-right) internal (luminal) distance, excluding thickness of walls, although it can also be measured as the external distance. End-systolic dimension ESD ESD is similar to the end-diastolic dimension, but is measured at the end of systole (after the ventricles have pumped out blood) rather than at the end of diastole. Fractional shortening (FS) is the fraction of any diastolic dimension that is lost in systole. When referring to endocardial luminal distances, it is EDD minus ESD divided by EDD (times 100 when measured in percentage). Normal values may differ somewhat dependent on which anatomical plane is used to measure the distances. Normal range is 25-45%, Mild is 20-25%, Moderate is 15-20%, and Severe is <15%. Cardiology Diagnostic Tests Midwall fractional shortening may also be used to measure diastolic/systolic changes for inter-ventricular septal dimensions and posterior wall dimensions. However, both endocardial and midwall fractional shortening are dependent on myocardial wall thickness, and thereby dependent on long-axis function. By comparison, a measure of short-axis function termed epicardial volume change (EVC) is independent of myocardial wall thickness and represents isolated short-axis function. Cardiac dysrhythmia is an irregular heartbeat that can occur in the ventricles or atria. Normally the heartbeat is initiated in the SA node of the atrium but initiation can also occur in the Purkinje fibres of the ventricles, giving rise to premature ventricular contractions, also called ventricular extra beats. When these beats become grouped the condition is known as ventricular tachycardia. Another form of arrhythmia is that of the ventricular escape beat. This can happen as a compensatory mechanism when there is a problem in the conduction system from the SA node. The most severe form of arrhythmia is ventricular fibrillation which is the most common cause of cardiac arrest and subsequent sudden death. ^ Schlosser T, Pagonidis K, Herborn CU, Hunold P, Waltering KU, Lauenstein TC, Barkhausen J (March 2005). "Assessment of left ventricular parameters using 16-MDCT and new software for endocardial and epicardial border delineation". AJR. American Journal of Roentgenology. 184 (3): 765–73. doi:10.2214/ajr.184.3.01840765. PMID 15728595. ^ a b c d e f g Maceira AM, Prasad SK, Khan M, Pennell DJ (December 2006). "Reference right ventricular systolic and diastolic function normalized to age, gender and body surface area from steady-state free precession cardiovascular magnetic resonance" (PDF). European Heart Journal. 27 (23): 2879–88. doi:10.1093/eurheartj/ehl336. PMID 17088316. ^ a b Normal ranges for heart rate are among the narrowest limits between bradycardia and tachycardia. See the Bradycardia and Tachycardia articles for more detailed limits. ^ a b "Normal Hemodynamic Parameters – Adult" (PDF). Edwards Lifesciences LLC. 2009. ^ Table 30-1 in: Trudie A Goers; Washington University School of Medicine Department of Surgery; Klingensmith, Mary E; Li Ern Chen; Sean C Glasgow (2008). The Washington manual of surgery. Philadelphia: Wolters Kluwer Health/Lippincott Williams & Wilkins. ISBN 0-7817-7447-0. ^ Salem R, Denault AY, Couture P, Bélisle S, Fortier A, Guertin MC, Carrier M, Martineau R (September 2006). "Left ventricular end-diastolic pressure is a predictor of mortality in cardiac surgery independently of left ventricular ejection fraction". British Journal of Anaesthesia. 97 (3): 292–7. doi:10.1093/bja/ael140. PMID 16835254. ^ Brenner JI, Baker KR, Berman MA (October 1980). "Prediction of left ventricular pressure in infants with aortic stenosis". British Heart Journal. 44 (4): 406–10. doi:10.1136/hrt.44.4.406. PMC 482419. PMID 7426202. ^ "Aortic Stenosis: Overview - eMedicine Emergency Medicine". Retrieved 2009-02-28. ^ Redington AN, Gray HH, Hodson ME, Rigby ML, Oldershaw PJ (January 1988). "Characterisation of the normal right ventricular pressure-volume relation by biplane angiography and simultaneous micromanometer pressure measurements". British Heart Journal. 59 (1): 23–30. doi:10.1136/hrt.59.1.23. PMC 1277068. PMID 3342146. ^ van Dam I, van Zwieten G, Vogel JA, Meijler FL (1980). "Left ventricular (diastolic) dimensions and relaxation in patients with atrial fibrillation". European Heart Journal. Suppl A: 149–56. PMID 7274225. ^ Grimsgaard S, Bønaa KH, Hansen JB, Myhre ES (July 1998). "Effects of highly purified eicosapentaenoic acid and docosahexaenoic acid on hemodynamics in humans". The American Journal of Clinical Nutrition. 68 (1): 52–9. PMID 9665096. ^ a b c Basavarajaiah S, Wilson M, Naghavi R, Whyte G, Turner M, Sharma S (November 2007). "Physiological upper limits of left ventricular dimensions in highly trained junior tennis players". British Journal of Sports Medicine. 41 (11): 784–8. doi:10.1136/bjsm.2006.033993. PMC 2465269. PMID 17957014. ^ a b c d e f g Page 41 in: O'Connor, Simon (2009). Examination Medicine (The Examination). Edinburgh: Churchill Livingstone. ISBN 0-7295-3911-3. ^ Lang, Roberto M. (1985). "Adverse Cardiac Effects of Acute Alcohol Ingestion in Young Adults". Annals of Internal Medicine. 102 (6): 742. doi:10.7326/0003-4819-102-6-742. ISSN 0003-4819. ^ "Left ventricle size - Echocardiography in ICU". Stanford.edu. 2009-06-23. Retrieved 2018-09-21. ^ de Simone G, Devereux RB, Roman MJ, Ganau A, Saba PS, Alderman MH, Laragh JH (May 1994). "Assessment of left ventricular function by the midwall fractional shortening/end-systolic stress relation in human hypertension". Journal of the American College of Cardiology. 23 (6): 1444–51. doi:10.1016/0735-1097(94)90390-5. PMID 8176105. ^ a b Ugander M, Carlsson M, Arheden H (February 2010). "Short-axis epicardial volume change is a measure of cardiac left ventricular short-axis function, which is independent of myocardial wall thickness". American Journal of Physiology. Heart and Circulatory Physiology. 298 (2): H530–5. doi:10.1152/ajpheart.00153.2009. PMID 19933422. This page was last edited on 21 February 2019, at 19:39 (UTC).